This image shows one of two "exact matches" to the Milky Way galaxy found recently. The larger galaxy, called GAMA202627, clearly has two large companions off to the bottom left. In the image, bluer colors indicate hotter, younger stars, like many of those that are found in our galaxy. Our home galaxy may be special, but it's not one of a kind. For the first time, astronomers have discovered two far-flung galaxies that are a near-perfect match of our own Milky Way. Spiral galaxies like the Milky Way are common throughout the universe, but the newfound "twins" share other key features as well. For example, both have satellite galaxies very similar to the Milky Way's neighboring Large and Small Magellanic Clouds, researchers said. “We found about 3 percent of galaxies similar to the Milky Way have companion galaxies like the Magellanic Clouds, which is very rare indeed," study leader Aaron Robotham, of the International Center for Radio Astronomy Research and the University of St. Andrews in Scotland, said in a statement. "In total, we found 14 galaxy systems that are similar to ours, with two of those being an almost exact match." Robotham and his colleagues pored over data from the Galaxy and Mass Assembly survey, or GAMA, which maps out about 340,000 galaxies in the local universe. 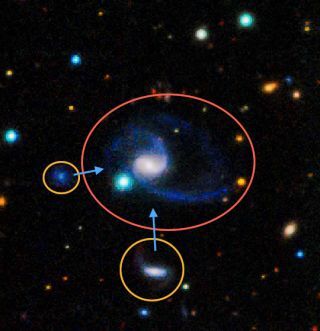 They weren't necessarily expecting to find any true Milky Way twins. "We’ve never found another galaxy system like the Milky Way before, which is not surprising considering how hard they are to spot," Robotham said. "It’s only recently become possible to do the type of analysis that lets us find similar groups." “Everything had to come together at once," he added. "We needed telescopes good enough to detect not just galaxies but their faint companions, we needed to look at large sections of the sky and most of all we needed to make sure no galaxies were missed in the survey." This amazing image seems to show the Milky Way streaming down not once, but twice, at ESO's Very Large Telescope on Chile's Cerro Paranal mountain. Actually, the photo shows a 360-degree panorama of the sky, so the two streams of stars are two halves of the band of the Milky Way arcing across the sky. The Milky Way is locked in a cosmic dance with the Large and Small Magellanic Clouds, which are clearly visible in the southern hemisphere's night sky. Many galaxies have smaller companions orbiting them, but few have two that are as large as the Clouds, researchers said. And such satellites don't stick around forever. "The galaxy we live in is perfectly typical, but the nearby Magellanic Clouds are a rare, and possibly short-lived, occurrence," Robotham said. "We should enjoy them whilst we can; they’ll only be around for a few billion more years." Robotham and his team presented their results today (Aug. 23) at the International Astronomical Union General Assembly in Beijing.